This English Muffin Bread requires no special machines – just simple ingredients that come together to make a delicious loaf! I don’t know anyone who doesn’t truly love fresh bread. In all honesty, there might be people out there that are trying to avoid eating grains (in general). Right? But deep down, I know that most people swoon for the smell of fresh baked bread. Over the last few years, I have tried to cut back on eating less carbs — and I can, for a little while. But then the temptation of making bread kicks in and before you know it, I am kneading away on what is the ultimate comfort food. A freshly baked, loaf of bread, slathered in butter and some honey. Raw honey. And lots of it. Goodness. I think I need to go to bread lovers therapy or something (is there such a place?) Really though, I love bread. Now that I’ve got that out of the way, lets talk about this bread. 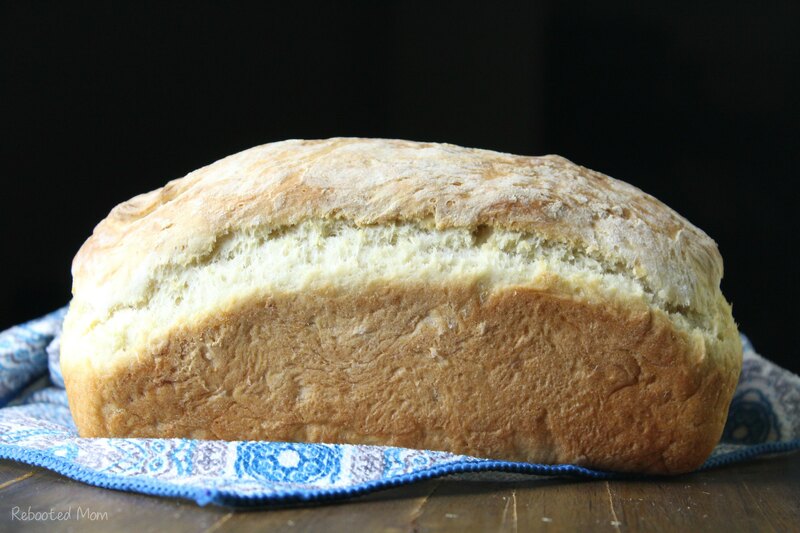 If you are looking for an unbelievably wonderful, easy, delicious bread, then this is it. English muffins are wonderful in all of their glory. Take those english muffins and transform them into a loaf of delicious, warm bread and you may not ever go back to english muffins ever again. This bread comes together quite easily with a few basic ingredients. Once you put in the oven, cooks up in just 25 minutes. Unlike many other breads, this one can be pumped out within an hour and a half — including rise time and oven time, which is unheard of for most homemade bread varieties. Get started by combining the milk, water, and yeast in the bowl of your KitchenAid. I typically warm up the milk and water slightly before mixing with the yeast – aim for 95-115 degrees. Allow that mixture to sit, undisturbed, for ten minutes – it should start to froth – which shows yeast activity. If yours does not froth then you may want to check the validity of your yeast, or the temperature of your liquids. Then add the remaining ingredients and use your mixer to combine well – use the third notch on your mixer and allow it to stir for a good 5-6 minutes. The dough should form a sticky ball. Grease a standard bread loaf pan (9×5) – sprinkle the bottom of the pan evenly with a tablespoon or two of cornmeal. 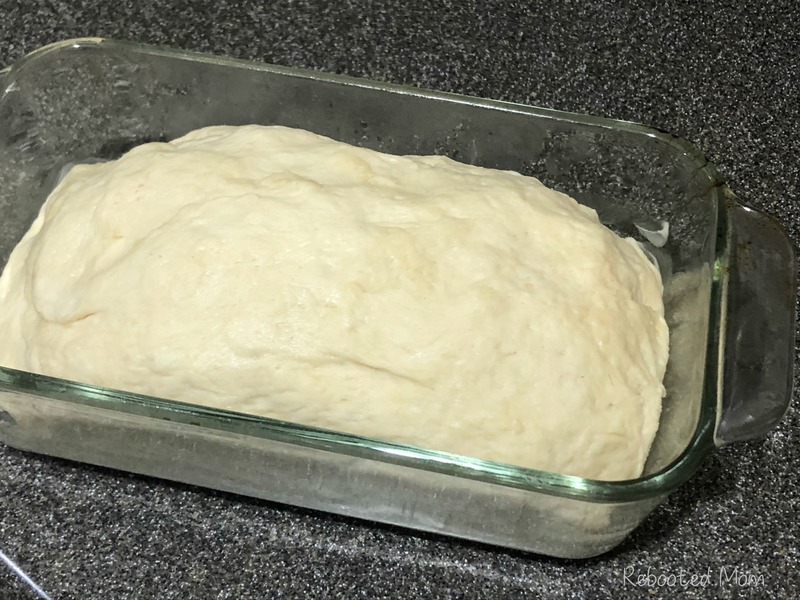 Transfer your sticky ball of dough to the loaf pan and loosely “tent” a plastic bag over the top of the bread pan and allow to rise for 45 minutes, or until almost doubled in size. As you wait, preheat your oven to 400 degrees F.
Place the baking dish in the oven and bake for 20-25 minutes at 400 degrees until golden brown on top, and hollow when tapped. Once removed from the oven, allow the english muffin bread the opportunity to cool before removing from the pan to slice. Wrap the bread tightly in plastic wrap to store. I haven’t tried freezing the loaf — it certainly gets devoured faster than I’d like. It is delicious when used for grilled cheese, and even better toasted with a pat or two of butter. Yum! I haven’t tried making english muffin bread with whole wheat flour – whole wheat in most cases will require a higher liquid to flour ratio. If you should try to make this with whole wheat flour, you may need to adjust the liquid in the recipe. Or, check out this recipe for Whole Wheat Bread. 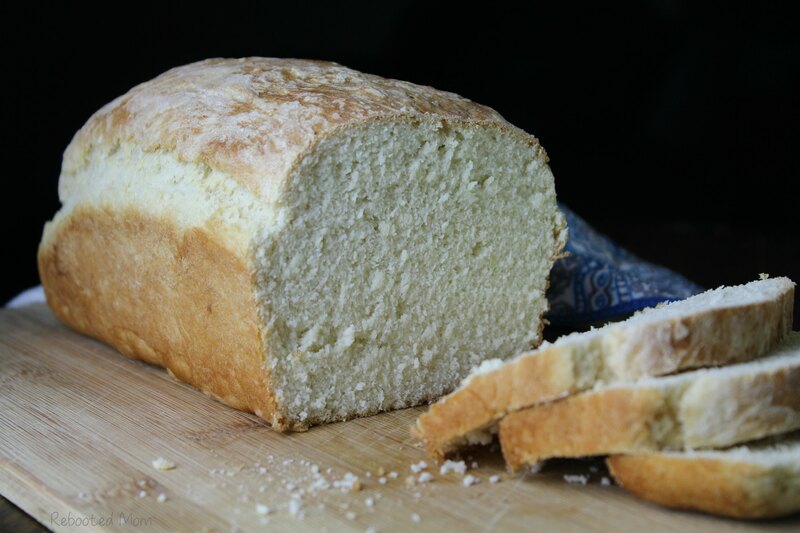 This English Muffin Bread requires no special machines - just simple ingredients that come together to make a delicious loaf! Combine your milk and water and heat ever so slightly to temp 95-115. Put that liquid in your mixer bowl and add the yeast - let sit for 7-10 minutes. After that time, the yeast should froth - if not, discard and start again with new yeast. In that same bowl of your stand mixer, add the sugar, salt, flour, and baking soda. Mix on notch 3 of your KitchenAid for 6 minutes. Mixture should work itself into a sticky ball. Generously grease your 9x5 loaf pan, and sprinkle corn meal evenly on the bottom. Place the sticky ball of dough within the loaf pan. Loosely cover with a damp rang or make a tent with a plastic bag - allow to sit for 45 minutes until almost doubled in size. While waiting for the rise, preheat your oven to 400 degrees; bake the bread in the fully preheated oven for 25 minutes until golden brown. Bread should be hollow when tapped. *I have not tried making this bread with whole wheat flour. If you should use whole wheat, you may need to adjust the liquid accordingly (more liquid may be required). Share the post "English Muffin Bread Recipe"